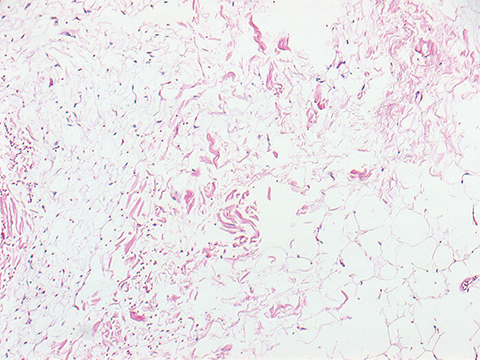 A 67-year-old never-smoker without a significant past medical history presented with a tender, 1.5-cm subcutaneous mass in her right neck. Immunohistochemical staining from a punch biopsy suggested intermediate grade bronchial neuroendocrine carcinoma (atypical carcinoid) with strongly positive cytokeratin-7, neuron-specific enolase, moderate thyroid transcription factor-1, and 40% Ki-67 proliferation index. 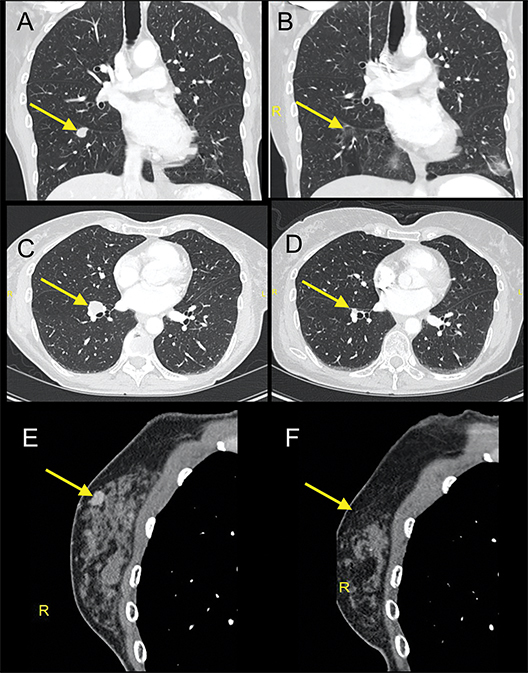 Baseline scans revealed right interlobar and inferior pulmonary lymphadenopathy, scattered pulmonary micronodules, and multiple pericentimeter subcutaneous soft-tissue nodules. Approximately 1 year after diagnosis, she enrolled in a clinical trial of temozolomide and an oral poly ADP ribose polymerase (PARP) inhibitor. After 4 months on treatment, she was noted to have 25% growth in target and nontarget disease (Figure 1 A, C, E) and discontinued the trial. Three weeks later, she underwent palliative radiation with 30 Gy in 10 fractions targeted to a symptomatic calvarial metastasis. One month after radiation, she noted rapid improvement in her skin nodules. 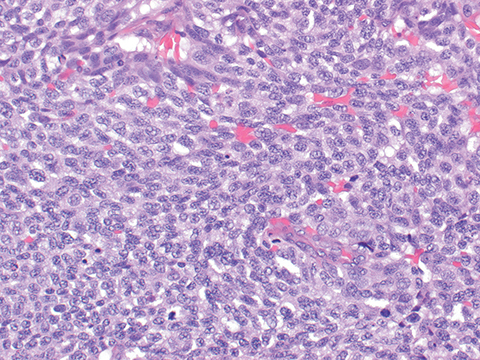 A repeat skin nodule biopsy revealed the tumor had been replaced by fat (Figure 2). Seven months after radiation, there was near complete response on imaging (Figure 1 B, D, F), and she received no further treatment. Updated imaging 18 months later confirmed a durable response. An abscopal effect is a rare event of tumor regression at a site distant from an irradiated field.1 First postulated in the 1950s, the effect has been investigated via in vitro studies that suggest transferable soluble factors in the growth medium2 and in vivo studies that report indirect T- and B-cell response in off-site organs in irradiated mice.3 More recently, it has been hypothesized that the response is an immunogenic modification of the tumor and its microenvironment, leading to an atypical vascular network flush with inflammatory cytokines that trigger danger-associated molecular patterns (DAMPs), which lead to the maturation of dendritic cells and priming of tumor-specific CD8+ T cells.4,5 Synergy with targeted immune treatment also has been suggested, which was described by Postow et al in a case of melanoma treated with ipilimumab and radiation therapy, which highlighted NY-ESO-1 as a potential antigen target heightened by radiation therapy.6 Cases of abscopal effect have been reported in nonsmall cell lung adenocarcinoma, thyroid medullary carcinoma, Merkel cell carcinoma, lymphocytic leukemia, hepatocellular carcinoma, renal cell carcinoma, and cervical squamous cell carcinoma,7 but clinical trials have yet to establish a consistent response in solid tumors.8 Bronchial neuroendocrine atypical carcinoid is not typically radiation sensitive.9 As such, the rapid and sustained response achieved by this patient suggests an immunogenic mechanism of an abscopal effect. It is assumed that the patient’s prior treatment with temozolomide and an oral PARP inhibitor is unrelated to this response, as disease progression was noted during that treatment, and radiation occurred several weeks after the trial was discontinued. Here we present the first case of abscopal effect in bronchial neuroendocrine carcinoma (atypical carcinoid) lung cancer. Additional studies regarding the mechanism by which an abscopal effect is elicited, especially in neuroendocrine tumors, is recommended. Mole RH. Whole body irradiation: radiobiology or medicine? Br J Radiol. 1953;26:234-241. Mothersill C, Seymour C. Medium from irradiated human epithelial cells but not human fibroblasts reduces the clonogenic survival of unirradiated cells. Int J Radiat Biol. 1997;71:421-427. Nagarkatti M, Nagarkatti PS, Brooks A. Effect of radon on the immune system: alterations in the cellularity and functions of T cells in lymphoid organs of mouse. J Toxicol Environ Health. 1996;47:535-552. Formenti SC, Demaria S. Systemic effects of local radiotherapy. Lancet Oncol. 2009;10:718-726. Derer A, Deloch L, Rubner Y, et al. Radio-immunotherapy-induced immunogenic cancer cells as basis for induction of systemic anti-tumor immune responses - pre-clinical evidence and ongoing clinical applications. Front Immunol. 2015;6:505. Postow MA, Callahan MK, Barker CA, et al. Immunologic correlates of the abscopal effect in a patient with melanoma. N Engl J Med. 2012;366:925-931. Reynders K, Illidge T, Siva S, et al. The abscopal effect of local radiotherapy: using immunotherapy to make a rare event clinically relevant. Cancer Treat Rev. 2015;41:503-510. Golden EB, Chhabra A, Chachoua A, et al. Local radiotherapy and granulocyte-macrophage colony-stimulating factor to generate abscopal responses in patients with metastatic solid tumours: a proof-of-principle trial. Lancet Oncol. 2015;16:795-803. Gustafsson BI, Kidd M, Chan A, et al. Bronchopulmonary neuroendocrine tumors. Cancer. 2008;113:5-21. Cummings AL, Kaprealian TB, Sarantopoulos GP, Mendenhall MA, Goldman JW. An abscopal effect in a case of neuroendocrine atypical carcinoid lung cancer. Appl Rad Oncol. 2017;6(3):38-39. The authors are from the David Geffen School of Medicine, University of California, Los Angeles. Dr. Cummings is a fellow, Department of Hematology-Oncology; Dr. Kaprealian is an assistant professor, Department of Radiation Oncology; Dr. Sarantopoulos is an assistant professor, Department of Anatomic Pathology; Ms. Mendenhall is a nurse practitioner, Department of Hematology-Oncology; and Dr. Goldman is the director of Clinical Trials in Thoracic Oncology and an assistant professor, Department of Hematology-Oncology.